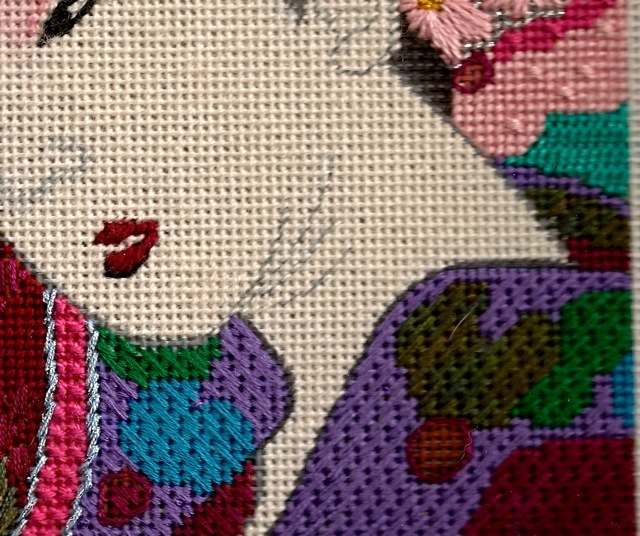 One of today's needlepoint style trends is to not completely cover very detailed and shaded parts of a canvas with thread, but to choose open stitches that allow the shading to show through. I've noticed people are curious about the technique so I thought I'd give some general information on light coverage if you want to try it. First of all, any stitch can be used for light coverage, even tent stitches. Just use a lighter weight thread than normal. Think about basketweave on a face—on 18 count one would normally use 3-4 plies of a cotton floss to cover. Try using 1-2 plies instead. Often the features (nose lines especially) will show through the thread and you can easily skip stitching those. In the example pictured above, this discontinued Melissa Shirley 13 count design had the face stitched with one strand of Impressions, which allowed the expressive facial feature lines to shine through. The nose, ear and neck lines were not stitched in gray. You simply see the gray paint showing past the white Impressions. 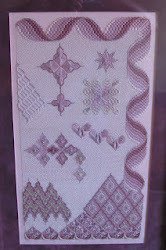 When you use lighter coverage stitches, you are going to have to use different techniques to start or end threads since often there is no good place to tie off your stitches unless a heavier stitched area is next door. (Red Geisha's face threads could be buried behind the robe area or her wig since those areas were full coverage. Here is an older Blog article about starting and ending threads for light coverage stitches. Here's another, more technical explanation from Joni Stevenson. There are a whole series of books that talk about light coverage stitches. (See above.) All three of Brenda Hart's books Favorite Stitches, Favorite Stitches II and Stitches for the Millennium (in the back row) feature stitches that work well in light coverage. 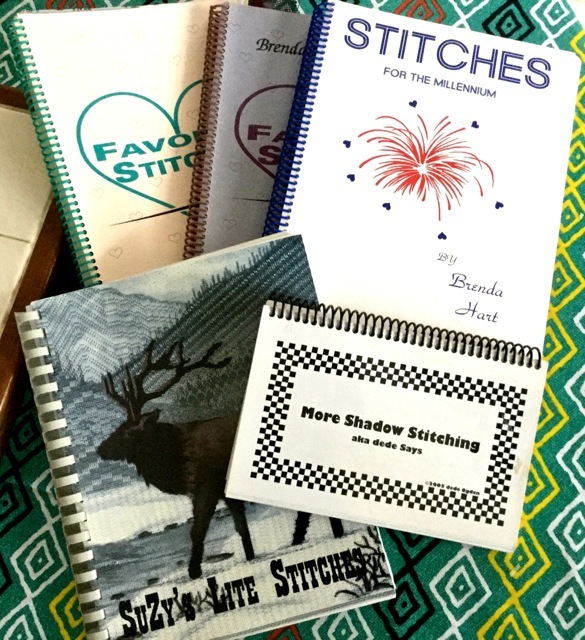 dede Odgen calls light coverage stitches Shadow Stitching and she has two books on the topic. I own More Shadow Stitching but not Shadow Stitching. The final book I recommend SuZy Murphy's Lite Stitches. 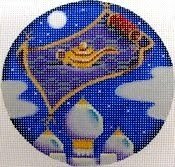 However, you can use any stitch as a light coverage stitch. If you like darning stitches, the Finger Step Designs books has one you might be interested in. UPDATE: SharonG's "It's About Darn Time" is also a great reference for darning stitches. Plus Amy Bunger's "Barely There" DVD is very useful as it is all about light coverage. 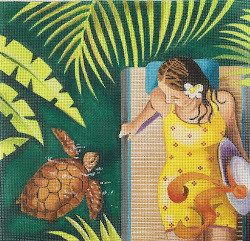 If you just want a few stitch ideas, read what Mary Legallet has to say about light coverage stitches, which she calls Open Work. Tomorrow I'll talk about the problems of mixing light and regular coverage stitches on a canvas. See you then! © Copyright September 20, 2017 Jane M. Wood. All rights reserved.